Successfully Added IP Surveillance Camera with Angle Control and USB Webcam Server to your Shopping Cart. This very cool IP camera can be installed on any network for security monitoring purposes. Just imagine, have full security control from any part of the world, all you need is an internet connection and your laptop. Monitor, Pan, tild, record in a number of video codec's including DIVX, FFD show, MPEG-4 and many more. Are you worried about security? Then we have found a great peace of mind IP camera for your home or office. This is an IP security camera that comes with email alert, motion detection, tilt and maneuvering functions with a click of the mouse and zooming capabilities. You can set up to 2 IP cameras and give each a static IP and view two different areas of your business of home. This IP camera supports motion detection recording with email alert. This means that you don't always have to keep your eyes fixed on the monitor, just go about your normal routine with complete peace of mind. Once you are logged in, you can manage an array of functions and change, modify, implement, view, and do so much more than just sit and watch. This model provides true versatility in its applications such as event notification, motion detection recording, email alerts and image recording. You can now truly say that you've got eyes at the back of your head. This smart IP security camera with motion detection and email alerts is in stock now, and available to you at a factory wholesale price from the leader in factory direct wholesale security surveillance systems, Chinavasion. Can I use any computer to monitor the and control the IP camera? No, this model IP camera comes with a software that must be installed on your computer or laptop, which will allow you to then monitor and control this IP camera over an IP address. Easy installation (but NOT with Vista), works perfectly! 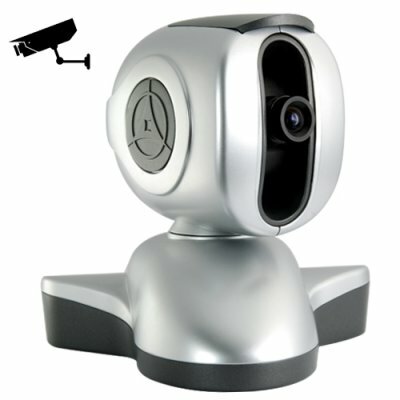 [JMC-IP001] Please note this IP camera comes bundled with a USB webcam server.